Smashing Staffie Cross Ace is appropriately named as he is a lovely, social boy. Ace is not doing well in kennels, so he’s urgently looking for a foster or adoption home with the help of Foal Farm Animal Rescue in Biggin Hill, Kent. 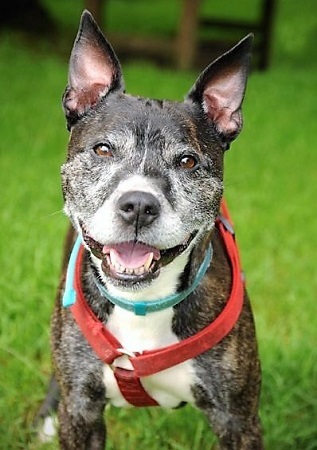 Ace is 8 years old and requires an active home as he enjoys his walks in the park that really are a walk in the park as he’s such a social boy, and an adopter who is willing to exercise him regularly as he does like to get out and about. Ace needs an owner who can appreciate his skills at escaping. He will require several weeks of settling in until his adopters can relax. He is such a lovely lad out and about with other dogs and living with a good-natured female may benefit him, but this is not essential. Ace does have a low level of possession with his toys, so any children in the home should be older (teenagers upwards). Cats are for chasing and are a no-no. Ace has been neutered and has no known medical conditions. Please mention that you saw Ace on the Oldies Club website.